Discussion in 'Bennett Trim Tabs Vendor Forum' started by Mittens, Nov 8, 2018. 2002 340 Sundancer, All Cherry Cabin, Black Canvas. 8.1 Mercs, V Drives, 4.5kw Westerbeke. would this over tax the rams? I want to shove the bow down and get back on top of the water. I would be concerned about the pressure you would be placing on the bottom hull hinge and tab by increasing the angle beyond its current lower limit. Two things to be concerned with. You may indeed be pushing the interlocking hinge too far down and damage it or bend the Tab itself. 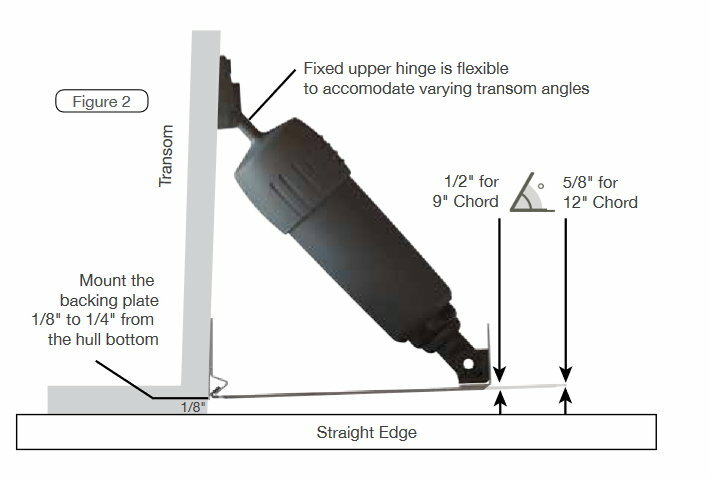 The standard angle of deflection for the Tabs provides the best lift to drag ratio. If you deflect it more than that it will create more drag than the addition lift it can generate. In other words it will stop being a Trim Tab and become a brake. which hing you worried about the upper or the lower on the Ram? I think his concern is the tab to hull backing plate hinge, rather than the actuator hinges. Yes, the hinge on the transom! On most of our Tabs it's an interlocking hinge. It's very strong and corrosion resistant, but unlike a piano hinge it cannot go all the way down or up. I would have to think that a spacer would also affect maneuverability when backing into a slip or backing down in general, not to mention excess stress on the rams when doing so. Tom? but could it go a little farther with some spacing or is this a big no no? some detail from the forum vendor would be great. You can a little bit, but you will reach the point of diminishing returns very quickly! Not sure what you mean by "some detail from the forum vendor would be great". SO extensions are basily a bad idea. I have seen extensions work fine, some examples here on Club SeaRay. But since I work for Bennett and we don't make or test them I cannot recommend them or give guidance about them. Drop Fins do help and adding larger Tabs do too. Do you have a photo of the transom and Tabs you could post? some detail from the forum vendor would be great. Tom is the Bennett expert, so you are getting "detail from the forum vendor". I assume you are trying to get the bow down more? If not already, change the anchor line to chain. Since there are no Drop Fins on the Tabs, I would a a set of DF12s to them first. I have 250 foot of all chain now. Did that swap last year.. This year new bottom paint, and while out tabs... so fins for sure. Got that. But should I make them bigger to? Wider to the tunnels? And then add drop fins? Or longer too. I don’t plan to pull it again so would rather have to much tab and can back off then not enough. And side note these pics where taken when I bought it. I don’t run around like a station wagon with those tops or is it named that or is it that dirty anymore. Measure how much wider to the tunnels you can go and we can see what replacement tabs you could use. As I mentioned I cannot really help with larger Tabs fore to aft. Also you will need to reposition the actuators so that they are in the middle of the tabs side to side. Bolt up and add a good amount?. I can measure from tunnel to tab.. wish I would have done that this summer. Would 3 inches in each side be noticeable? Then add the drop fins too? Around 20 months ago I added 1 inch to each side (to 26 inches) to max the available space and 3.5 inches to the chord (to 15.5 inches) as well as 3 inch drop fins. Actuators are fine, but I did sheer a nylon hinge pin during testing which I was able to change in the water. I replaced the pin with the stainless version and has been good ever since. Suggest you replace the hinge and pin fixtures to ensure reliability. I can now plane down to 12 knots with the tabs fully dug in whereas the tabs previously had no effect whatsoever at that speed. As I bury the tabs at that speed I also pick up around 3 knots, so I'm pulling back on the throttles to maintain the 12 knots which is the speed limit in one of the areas I boat.